After my last post grumbling about Brighton Holiday Homes, I have been musing on what positive steps could be taken to improve the situation for the city’s permanent residents and encourage greater neighbourliness. My suggestions are informed by a few key thoughts. 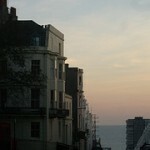 Firstly, that Brighton is a tourist resort and tourists are critical to the city’s economy and soul. So, holiday lets are always going to be part of the mix. Secondly, housing is a very precious commodity in Brighton. We have an acute shortage of homes, rents are sky high and house prices are astronomical. A holiday let essentially takes one house out of the community and doesn’t put anything back in. Thirdly, I make no bones about it, these holiday lets and the related agencies are money-making enterprises. They are ‘second homes’ that exist predominantly as investments to generate profits. I wish I could tell you how many homes in Brighton are holiday lets but I can’t find out an accurate figure from a reputable source. Which leads to my first suggestion…. If you run a property predominantly as a holiday let (I don’t mean the occasional Airbnb type thing), it should be publicly registered with the council using an online form with contact details made available. When we had our Brighton Holiday Homes problem, we didn’t know who to contact or alert. This way we’d have known immediately, with a quick postcode search. It would also be useful to have a sense of how many holiday lets we have in town and where they are. In particular, that would help determine whether greater regulation of the sector is required. The last thing we want is an area with a very high density of holiday lets. I’d also suggest a fee payable for all holiday lets on a per-property basis (whether agency or let by an individual) and that fee should adequately fund the registration process and cover the cost of the website, officer and team. I moot £500 (as a starter) per property per annum as a very modest fee to cover these costs. Agencies will also have to pay a registration fee, if they want to operate in the city. (I’m not clear how that would work exactly, but no problem is insurnountable). £500, please note, is only the cost of 25 day’s parking on the seafront. The relevant holiday lets officer and team could also ensure that properties meet basic standards and even provide a Stars system or the like so visitors would know that the properties themselves were of a good standard and rent them with greater confidence. One of the first things this holiday let team should do is frame the Neighbours’ Charter. This will be a code which lays out what neighbours can expect from a local holiday let and provide a framework for judging whether a holiday let landlord or letting agency is being neighbourly enough. This can cover noise and the like. It should be drawn up by the officer with input from landlords, holiday let firms and also community groups and residents’ associations. There are a few things I would like to see included in this charter. Firstly, that the neighbours of a new holiday let arriving in the area should be informed of that and who to contact in the event of a problem. I also think that in the event of a noise complaint, that a representative should visit the property within one hour 24/7 and remedy the situation. This is my favourite idea, even if I am a bit hazy on exactly how it would be administered. All the individuals and agencies profiting from holiday lets will be required to pay an annual sum, not into the council coffers but a separate pot. Let’s say £100 a year, per property. This fund would then be made available to the neighbours of holiday lets to undertake something worthwhile in the immediate vicinity. I’m thinking about things like a grant for hanging baskets, money towards planting up a green area with spring bulbs, cash towards a street party. You get the picture. In the most extreme cases, if problems are not addressed over a period of time, then the council should have the power to shut down a holiday let. Hefty fines for negligent landlords and their agents also seems like a good idea. Isn’t this all more needless red tape? Red tape, yes. Needless, no. Holiday lets and agencies (rather like the private lettings sector) are currently almost entirely unregulated. Apart from some minor legal requirements (and more for bigger properties), all you need is cash to get on this particular gravy train. And frankly, compared to the qualifications and registrations that other industries and professionals are expected to adhere to, these are not onerous responsibilities or costs. Consider the guest house proprietor or the hotelier: they have a lot more regulation to put up with. It could also be argued that holiday lets merely offer the same headaches that can come with a rowdy household. And that’s true. An unruly family can be a nightmare. So can a loud HMO. But the critical distinction with holiday lets, for me, is that they only take from a local community and don’t, as far as I can see, add anything meaningful. As we saw from Michelle Stonehill of Brighton Holiday Homes at the Chamber of Commerce Big Debate (her comments have been partly reported in the Argus today), they think they are doing a great job and are good neighbours. My view is that they are making lots of money but not doing enough to ensure their holiday lets have a minimal negative effect on local people. I think the balance now needs to be redressed with the empowerment of local communities. None of these ideas will affect the genuinely responsible, profitable holiday lets firm or landlord. They will be doing this already (bar the levy). And if these suggested minor rules and regs deter some people from choosing to get in to the holiday let game, or they choose to invest elsewhere, then that’s not a massive problem.